Six days shall all work for pay, all work not of Yahweh, and all business shall be done, but the Seventh Day is a Sabbath. You shall cease from doing all workfor pay, all work not of Yahweh, and all business, and you shall gather to sanctify the Name of Yahweh, showing your loyalty to Him by doing Righteous works. It is the Sabbath of Yahweh in all your dwellings. 8 And you shall zealously offer yourselves to Yahweh in service for seven days. On the Seventh Day you shall gather to sanctify the Name of Yahweh, showing your loyalty to Him by doing Righteous works, therefore doing the Work of Yahweh. And you shall proclaim on that same day that everyone is to gather to sanctify the Name of Yahweh, showing your loyalty to Him by doing Righteous works, therefore doing the Work of Yahweh. It shall be a Statute forever in all your dwellings throughout your generations. 24 Speak to the children of Israyl, saying; In the Seventh Moon, on the First of the Moon, you shall have a Sabbath, a Memorial of Blowing of Trumpets; the Feast of Trumpets. You shall gather to sanctify the Name of Yahweh, showing your loyalty to Him by doing Righteous works. 25 You shall therefore do the Work of Yahweh, zealously offering yourselves to Yahweh in service. 35 On the First Day you shall gather to sanctify the Name of Yahweh, showing your loyalty to Him by doing Righteous works. for seven days unto Yahweh. And for seven days you shall zealously offer yourselves in service to Yahweh. On the Eighth Day; The Last Great Day, you shall gather to sanctify the Name of Yahweh, showing your loyalty to Him by doing Righteous works; and you shall zealously offer yourselves in service to Yahweh, along with the burnt offerings, the grain offerings, the sacrifices, and the drink offerings required on each day. So on the Fifteenth Day of the Seventh Moon, when you have gathered in the fruit of the land, you must keep theFeast of Yahweh for seven days. On the first day there shall be a Sabbath, and on the eighth day a Sabbath. If you will count for yourself, you will find that Yahweh has seven Holy Convocations (gatherings), seven Sabbaths, including His weekly Seventh Day Sabbath. Therefore, in order for this to be a Holy meeting for assembling and reading, Yahweh Himself must also be there, and if Yahweh is not there, these convocations will not be Holy. 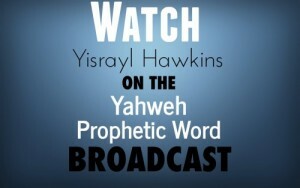 The House of Yahweh was built for the Service of Yahweh, for teaching the people the Way of Yahweh. Yahweh only acknowledges one Body in these Last Days. The House of Yahweh re-established in Abilene, Texas, is the only Place where Yahweh has chosen to establish His Name for the keeping of His Feasts in their Appointed Seasons. Yahweh gave instruction to us in these Last Days concerning His Appointed Seasons. Yahweh’s Eyes and Heart are at The House of Yahweh, and He will be here if we walk before Him, by keeping His Laws, Statutes, Ordinances, and Judgments. The Eyes and Heart of Yahweh are at His House at the exact, appointed times which He has ordained. The exact, appointed times which Yahweh has ordained are: His weekly Seventh Day Sabbaths and His Holy Convocations, called Sabbaths, during His Appointed Feasts. Remember that only these Feasts kept at Yahweh’s Appointed Times and at the place that He has chosen, Yahweh regards as His. This world’s governments are going to pass away, along with all the lusts that are rampant in this world. But, those who keep Yahweh’s Laws will abide forever; they will abide under the Shalow of Yahweh. Those who will practice what Yahweh says will be protected from the wars, from the sickness and disease, and from the death that will soon come on this earth. Now is the time to make plans to attend each and every Feast that Yahweh commands. 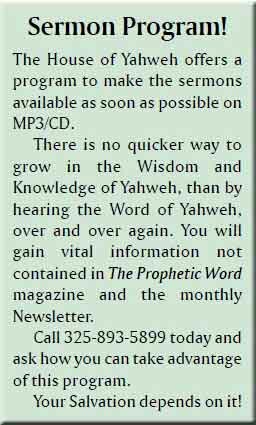 The House of Yahweh regularly sends out invitation to those whom Yahweh has called, informing each person about where and when Yahweh’s Feasts are kept with Yahweh’s Family, The House of Yahweh. After reading this article in its entirety, you will then know the vital importance of keeping Yahweh’s Feasts. If you keep Yahweh’s Feasts they are Yahweh’s Shadow over you from the things that are coming; but, if you do not keep Yahweh’s Feasts, exactly according to His written Ordinances, then you are keeping your own feast, which Yahweh hates. Literally thousands of people now claim to keep the Feasts of Yahweh. I do not know how many times I have been reassured that: “I and my whole family keep the feasts.” Although I hear these people making this statement, I simply do not see them here at The House of Yahweh during Yahweh’s Feasts. In fact, due to the very way in which they celebrate, their celebrations are feasts of man and not the Feasts of Yahweh. Yahweh knows our hearts. He knows there are ones who greatly desire to come to His Feasts but who are unable to because of restrictions by governmental systems. Those held back by things beyond their control are still able to be connected to Yahweh by being in unity with His Great House at Abel. We look forward to the day when all are free to come to Yahweh’s House to keep His Great Feasts! Yahweh plainly shows that unless His Ordained Feasts are kept on the exact days, according to His exact Governing Ordinances, and at the place He has established to set His Name, these feasts will definitely not be His Feasts. These feasts will be your feasts, which Yahweh says He hates. 14 Your new moons and your appointed feasts My Soul hates. They are a trouble to Me. I am weary of bearingthem. 15 So, when you spread forth your hands, I will hide My Eyes from you. Yes, even though you make many prayers,I will not listen, for your hands are full of blood. 17 Learn to do Righteousness; seek Judgment, relieve the oppressed, judge the fatherless, plead for the widow. 18 Come now, and let us reason together, says Yahweh: though your sins be like scarlet, they will be as white as snow; though they are red like crimson, they will be as wool. 20 But if you refuse and rebel, you will be devoured by the sword, for the Mouth of Yahweh has spoken it. Why would Yahweh hate, and refuse to accept, a feast supposedly celebrated in honor of Him? Why would such a feast, in fact, shut people off from Him, making Him hide His Eyes from them and not even hear their prayers? Yahweh has given us the answer to these questions. If you will be willing and obedient, you will eat the fruit of the land. They are not Yahweh’s Feasts unless they are kept in the place Yahweh chooses. The only way we can know where Yahweh has chosen, is through Yahweh’s Prophecies, in which He gives us instruction. We know that Yahshua is the Messiah, the Savior, because He fulfilled the Prophecies written about Him. In the same way we can know where Yahweh’s established House is today. Yahweh told us in Prophecy where His House would be established in these Last Days. He gives us the location of The House of Yahweh, the time period in which His House would be established, and He even gives us the names of the Two Witnesses who established His House. 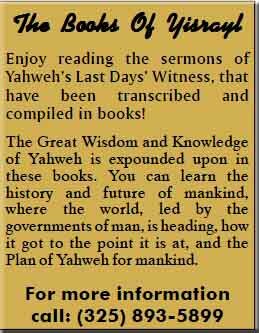 Write for information about the Two Witnesses, and ask for our booklet, The House Of Yahweh Established, which explain these Prophecies in detail. This information is vital to your understanding of where Yahweh’s only Prophesied Work is located in these Last Days. Yahweh will be at His Feasts, if these Feasts are kept according to His Will. Yahweh does not leave anyone doubting what His Will is. His Will concerning His Feasts is written in Ordinances (Laws) in the Holy Scriptures. Yahweh’s Sabbath Day of rest is the Seventh Day of each week, according to Yahweh’s Ordinances (Laws). We find some of these Ordinances written in the Ten Commandments, such as the one concerning the Sabbath. 11 For in six days Yahweh made the heavens and the earth, the sea, and all that is in them; and rested the Seventh Day. Therefore, Yahweh blessed the Sabbath Day, and hallowed it Yahweh made the Sabbath Day Holy. If one knows that these Ordinances, Laws, are the Will of Yahweh, but refuses to obey these Ordinances (Laws), then that one has become a transgressor of the Law. The Apostle Yaaqob, in effect, tells us we do not have any right to pick and choose the Laws we like, obeying the Laws which suit us but rejecting the Laws which do not. We must obey all of Yahweh’s Laws or we become transgressors of the whole Law. Yahweh has emphatically told us in Isayah 59:1-2 that it is because of our breaking of His Laws that He separates Himself from us, not even seeing or hearing a sinner. Yahweh’s Ordinances concerning His Feast Days are just as much a part of His Laws as His Ordinances concerning His weekly Sabbath Day. If any of Yahweh’s ordained Feasts are not observed strictly according to His Ordinances, Yahweh will have no part of that sin. Yahweh simply will not be there, and those who are there are deceived. Over the years many people have written us, requesting information about keeping Yahweh’s Feasts in their own homes. The answer to this question has always been the same. The Scriptures do not allow anyone to observe the Feasts of Yahweh in any place other than the place Yahweh Himself chooses. Choosing to observe the Feasts in any other place, except the place Yahweh has chosen to establish His Name, would bring only curses upon anyone trying to do such, and would result in that person being shut off from Yahweh. This is true whether you are acting on your own or whether you are following any church or assembly. 8 You must not at all do as we are doing here this day—every man doing whatever is right in his eyes. Notice verse 5 again, which says: “You are to seek the habitation of your Father; The House of Yahweh__the place which Yahweh your Father shall choose out of all your tribes to establish His Name, and there you must go.” This is a Law of Yahweh. We are to search for the place Yahweh chooses, and then we are to go to the place Yahweh has chosen. If we do not obey this Law, we simply will not be keeping a Feast of Yahweh; we will be keeping a feast of our own. For those who are unable to attend Yahweh’s Feasts due to restrictions from governments, you are still able to be in contact with Yahweh by receiving instructions from Yahweh’s House at Abel. Unlike the worldly holidays celebrated by this deceived world today, which have no reason to exist since they are the worship of pagan Gods inspired by Satan the Devil, the keeping of Yahweh’s Feasts promises you a great reward, if you will keep them strictly according to Yahweh’s Way. The remnant of Yahweh’s Chosen are being gathered out of this beastly system and given the opportunity to train for wonderful positions in the Kingdom of Yahweh. The House of Yahweh, the Family of Yahweh, keeps all of Yahweh’s Feasts, exactly according to His every Word. Yahweh’s Feasts are the Shadow of Yahweh, the Mark of Yahweh upon those who will practice them according to Yahweh’s Ordinances. In the following Scriptures, Yahweh shows us the way of escape. And the Spirit and the bride, say: Come. And let him who hears, say: Come. And let him who is thirsty come. Andwhoever will, let him take the water of life freely. In Yahshua Messiah’s Name, I invite you to escape. The Sabbaths and Feasts ordained by Yahweh are set times that mankind is permitted and commanded to appear before Yahweh at the place Yahweh chooses to place His Name. When we compare Yahshua’s Words in Luke, we see how serious it is to believe Yahweh’s Prophets because there are many religions in the world today but there is only one Work where Yahweh has chosen to place His Name. 27 And beginning at Mosheh; the Laws, and all the Prophets, He expounded to them in all the Scriptures the things concerning Himself. 31 If I alone testify in My behalf, My Testimony is not valid. 34 However, I do not accept testimony from man; but I say these things, so that you might be saved. 43 I have come in My Father’s Name, but you do not follow Me. Let another come in his own name; him you will follow in order to obey! The Great Prophet Yeremyah was speaking of all of the religions today when he showed how they hated the Name of Yahweh. Notice verse 22. The religions today do not teach Yahweh’s Laws. That’s the reason the morals of today are at the very bottom and the earth and people are filled with sickness, disease, hatred, violence and soon nuclear wars. Notice further verse 21. Yahweh did not prophesy that His House would be called the Catholic church or the Holy Roman church that sits on seven hills. Notice what else. You need to read that Scripture again and remember the false prophets (preachers) are still telling the people today to use lord instead of Yahweh and they still refuse to keep the Fourth Commandment. False religions do not keep Yahweh’s Sabbaths or Feasts, and there are many today but they are not of Yahweh the Creator. 23 But then I will declare to them; I never knew you. Get away from Me, you who practice iniquity; you who break the Laws of Yahweh! Again, let us look at what iniquity is. 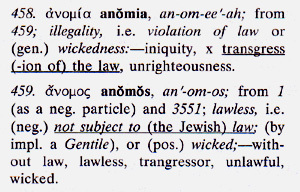 According to the Greek dictionary in Strong’s Exhaustive Concordance, the word iniquity is word #458 from word #459, and means: transgression of the Laws, not subject to the Laws. The seventh day is Saturday as we see in the following definition from the American Heritage Dictionary. Sat·ur·day n. Abbr. S., Sat. 1. The seventh day of the week. 2. The Sabbath for many Jews. The religions say they keep Sunday because the Savior rose from the grave on Easter Sunday morning, but this, too, is a lie. For proof, write or call for our booklet An Easter Remembrance. (video) There is no command from Yahweh, or the Savior, or any Apostle to keep Sunday, neither is there Eternal Life for one who does so. 16 And, behold, one came and said unto him, God Master, what good thing shall I do, that I may have eternal life? The Disciples were inspired to write the same. So why don’t the religions keep Yahweh’s Seventh Day Sabbath by resting from their work as Yahweh did from His. The answer is, they don’t belong to Yahweh, they are rebellious, and they do not believe. 27 But a certain fearful expectation of Judgment, yes, a Zealous Judgment. For it will come to pass that the adversaries will be devoured. Where will you find the Laws of Yahweh taught and practiced today? Only at the place where Yahweh’s Prophets foretold that Yahweh would establish His Work in the Last Days by the Two Witnesses. There you will find the Name—The House of Yahweh—and you will find the following Sabbaths and Feasts, Holy Convocations, being celebrated. 3 Six days shall work be done, but the Seventh Day is a Sabbath of solemn rest, a Holy Convocation. You shall do no work on it. It is the Sabbath of Yahweh in all your dwellings. 15 And you shall count for yourselves, from the day after the First Holy Day Sabbath—from the day that you brought the sheaf of the wave offering: seven full weeks shall be completed. 16 Count off fifty days, up to the day after the seventh week; then you shall offer a new grain offering to Yahweh. Speak to the children of Israyl, saying; In the Seventh Moon, on the First of the Moon, you shall have a Sabbath, a Memorial of Blowing of Trumpets; The Feast of Trumpets, a Holy Convocation. 27 Also the Tenth of this Seventh Moon is the Day of Atonement. It shall be a Holy Convocation for you. You shall afflict your souls, and offer an offering made by fire to Yahweh. 28 You shall do no work at all on that same day, for it is the Day of Atonement, to make atonement for you in front of Yahweh your Heavenly Father. 39 So on the Fifteenth Day of the Seventh Moon, when you have gathered in the fruit of the land, you must keep the Feast unto Yahweh for seven days. On the first day there shall be a Sabbath, and on the eighth day a Sabbath. 40 On the day before, you are to take choice fruit from the trees; pomegranates, and palm branches, leafy branches, and willows of the brook; and you shall rejoice in front of Yahweh your Father for seven days. Notice again verse 4. These are Yahweh’s Feasts. Soon you will see nuclear wars that will kill a third part of man over a fourth part of the earth in and around the great River Euphrates. This will be a very precise Prophecy, a third part of man in that fourth part of the earth. If you live, you will see this precise Prophecy.Then you will start to believe Yahweh and look to Him for protection because the religions that have taught the whole world to rebel against Yahweh’s Laws, which in itself will cause these great nuclear wars, will not repent even after a third part of man has been killed over that fourth part of the earth just as the Prophets have shown. The wars will continue until four-fifths of the earth’s population is wiped out and the sun is darkened. 5 The earth also is defiled because of the inhabitants of it, because they have transgressed the Laws, changed the Ordinance, and broken the Everlasting Covenant. Did you notice this nuclear burning will be on the priests (preachers, religious leaders) who teach rebellion against Yahweh’s Laws that are found in your bible? The Sabbaths and Feasts are Eternal Appointments with Yahweh Himself and the Savior, Who is High Priest over The House of Yahweh. Keeping the appointed Sabbaths and Feasts proves your obedience and belief in Yahweh and the Savior Yahshua. Keeping Holy what Yahweh made Holy is keeping your appointment with Yahweh, showing obedience to Him, and showing you are part of His Eternal Kingdom. Disobedience proves you belong to the serpent. The false religions will not be judged for what you do. However, you will be judged for following them into rebellion against Yahweh’s Sabbaths and Feasts, which are actually appointments with Yahweh at His House. He shows in Prophecy the place He chooses to place His Name. Whether you obey or not your sentence will await you. Your judgment is based on what you decide to do and whom you decide to obey. Decide to obey the Creator Yahweh, so you can have Eternal Life and Appointments with Him forever. Come to this Feast with the hope of learning what the world has rejected—the Laws of Love, True Love for Yahweh our Heavenly Father and for man. Yahweh’s Laws teach one how to have a perfect relationship with Yahweh and with mankind. 26 Let us not become full of empty pride and ambition, not challenging nor defying one another, not being jealous of one another. Remember Yahshua taught us to be servants to one another, so did the Apostles. For you were called into liberty, brothers, but not liberty to be instruments of carnality; but through the Love of Yahweh, serve one another. Whatever you have been assigned to do, do it with joy. This time come to learn to serve one another. This is the Spirit of Yahweh that brings joy and a strong connection to stand in the days ahead. 10 Blessed are those who are persecuted for Righteousness sake, for theirs is the Kingdom of Yahweh. 12 Rejoice, and be exceedingly glad, for much is your reward in heaven, for in the same manner they persecuted the Prophets who were before you. However, do not rejoice in this—that the spirits are subject to you; rather, rejoice that your names are written in heaven. Let us all help one another to make this Feast to Yahweh the Greatest Feast of Rejoicing ever.